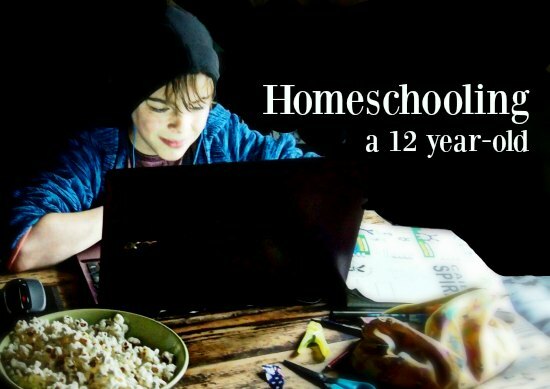 By homeschool group hug Last Modified: November 12, 2018 13 Comments Any post on this site may contain affiliate links. If you use them, they cost you nothing extra. We make a small commission. My elder child was 12 last week. It’s not one of the big milestones, he didn’t become a teen and didn’t pass from junior school to high school, but he’s changed so much I thought I’d tell you about it. Homeschooling a 12 year old is very different to homeschooling an 11, 10, or, obviously, 6 year old. That is one of the beauties of home education, it changes and evolves over time, with you and with your child. It’s been a fascinating journey and one that at times stressed me out, gave me sleepless nights and tied me in knots. So now I want to tell you that it gets better. I want to tell you to chill! When they were tiny it was all about milestones, getting them to recognise letters and numbers, reading, addition, taking away. You could almost check things off a list. I tried to do it that way and got very stressed out when I sometimes couldn’t tick the box at the “correct” age. I wish I could go back and tell my new homeschooler self to relax. That thing they call de-schooling happens then. It’s when you start to unlearn what you think education has to look like. You see them learning things all by themselves, just picking things up from life and eventually you realise that mum doesn’t really have to be educator at all. Mum just needs to be facilitator. That’s when I went through my total unschooling phase. What happened? They watched Minecraft videos from dawn to dusk. That, to me, was no way to live so we went back to the books. Just a little, not much. About that time we set off to travel the world, 3 years later that’s still what we do. Our home education evolved into an eclectic worldschool, homeschool, unschool mis-mash that suited us all. But STILL I didn’t think they were learning enough. They were just too young. My younger son is almost 10, my elder just gone 12, the difference between them is immense. The 10 year old will still happily watch Minecraft videos all day if he could, the 12 year old has his own ideas and projects he wants to try. When people talked about self motivated learning I would feel inadequate, why weren’t MY kids doing that? They were too young. A big shift happens around 11 or 12, it did for us, anyway. It’s a wonderful age ( we parents say that about ever age, right?) but it really is! They’re smart, cool, funny, able to hold their own in adult conversations and bursting with ideas. I can’t keep up with HIM now, he ties me in intellectual knots. He knows more than me in just about every subject he’s interested in. That includes history, mythology, classics, some aspects of computers, animation, editing, loads of things! I pride myself on being pretty tech-savvy, it’s my job. He’s better than me in quite a few areas. I don’t need to teach him at all, he’s teaching himself and hopefully as he leaves me for dust he’ll teach me. His skills are useful to my business and hopefully will be to his. I would pull my hair out as he watched all those You Tube videos and animations, but now, WOW! He was packing it all away, getting ideas and inspiration for future use. He’s applying it, being inspired and creative, I love what he’s doing. READ NEXT BLOG Should We Homeschool? Reasons to Homeschool. So that’s my message for today, if you’re still stressing over when this self-motivated learning will start, it does, it will and when it begins, it’s amazing! What is my 12 year old reading? I think that’s enough for now! Exactly the same thing happened with our oldest at 11 years of age ?. In a very bureaucratic country like France, you need “the right papers” to get the right job – so it would scare the sh.t out of me to get my kids out of school … But then again, they may very well not stay in France! Talitha, do ” The Right Papers” include some sort of school attendance record? There’s nothing to stop HomeSchooled kids getting exams or university qualifications, they just get them without having to spend their days in school. It’s perfectly possible to just turn up and sit the exams. Please explain! Also, I’m really hoping the boys will be self employed, creae their own businesses as I have and as my ( extremely prosperous) brother did. I don’t see any need for them to be “normal”. Unless of course they want to be doctors ( over my dead body!) vets, accountants, all the main-stream stuff, in which case they just enter university when they’re ready. You’re very welcome Helen. This is why I try to take time away from the travel blog to be a homeschool blogger. It’s important to support and encourage homeschoolers. YEAH! I totally hear ya! I get it now too. My girl is 13 and the last year’s leap has been phenomenal. I even wrote much the same as you to al the newbies out there. To trust a lot sooner than we did (or perhaps all the doubts and freak outs helped the journey too – who knows). Either way, it all comes out in the wash with dedicated parents behind their kids allowing them a mixture of experiences, a variety of schooling methods, and a heap of trust. It’s all just so exciting – HOME’S COOL! This was so encouraging. Thank you! I would really love any advice that you or any of your readers may have. We live in Queensland, Australia and legally we have to report in three months time to display the “progress” that my children have made over a 10 month period. We took our children out of school 7 months ago and decided to spend three months screen-free, house sitting farms to reconnect as a family and to enjoy some real life experiences together. At this point in time I hadn’t heard about deschooling/unschooling. So after about three months we started to encourage them in their spare time, to explore the different resources that I had discovered prior to them leaving school. I suggested a range of things like journaling, exploring different topics at the library, watching documentaries, a variety of on line courses, apps etc and it was apparent that they both weren’t interested in anything that I was showing them. I am convinced that we need to deschool and so we began this process three weeks ago. We have had number of discussions as a family and the children now know that they are able to control what they do with their time. They spend most of their days playing games on their ipad and watching movies. I’m totally fine with this and understand that they have never been allowed to do what they want so of course they are going to choose the things they enjoy the most. And I’m fine with that. As most parents (from what I’ve been reading/researching) that choose to go through this process, discover that this journey is more about them than the children. I have personally discovered many aspects of my parenting that needs to change and although confronting, I am thoroughly enjoying the thought of making changes that will contribute to a more enriching relationship with my children. It’s amazing that we are already experiencing positive changes. My only concern is writing this damn report. I am committed to the deschooling process and realise that it may still take another 6 – 12 months but how can I get around this in my report? The most upsetting thing of all is that 6 years of school has left my son feeling (my son’s words) “completely stupid”, with little to no confidence, anxious about what he’s going to be when he grows up, he thinks he has no interest or desire to learn anything and he’s feeling like a lost little boy at the moment. Although we have years of report cards and tests to show that he has “improved” on paper, my precious little man is not feeling this in the flesh! The poor kid! Well, there are examples of reports ( mine) on this website, go to the bottom of the page, in the middle, under ” Categories” Select the category Queensland Homeschool Reports and Applications. You can’t tell them you’ve been deschooling, no. You’ll have to find a creative way to demonstrate progress. Hard I know, but these are the hoops you must learn to jump through. We left Queensland when my eldest was 8 and have been home educating under the British system, so I’ve not had to write one of those reports in a very long time. I was in bed this morning thinking about what I would put in a report if I had to write one now. Maybe I should post about that. Anyway, the very best of luck to you and I hope you find a way to make it work. What about the integration with other people their own ages? We are Canadian and are wanting to take our son out of school for a year and travel. Our thoughts are that when we come back we will move to Atlantic Canada and my concern is, if we keep him out of school how he integrates with people his own age, and learn from people a year or two older and even the patience with younger children. He is an only child. We are thinking of taking him away during his Grade 8 year. Sondra, 1 year is nothing, it won’t change anything at all. My son is almost 13 and has’t been in school since he was 7. He will integrate with anyone on the planet! Seriously, school has NOTHING to do with how kids perform as human beings, if anything it has a detrimental affect. That pack mentality, that avoidance of adults, that age segregation, that division into” us” and ” not us”. It’s all bad stuff . It’s all school stuff. The real world is a much better place, where human beings mix freely. Hi there, can I ask a question about further education please? If you children decided they wanted to be a professional for eg: Dr how would they deal with a university or a work placement setting? Do they take exams to qualify them for uni? Just curious.. They can if they choose to Lisa, no problem at all.